Generally, with dedicated sound cards, we recommend to directly connect the Squeezelite volume control to the hardware control of your sound card. With the standard setting you have a software volume control and a fixed hardware volume on your sound card – but this does not improve your audio quality. 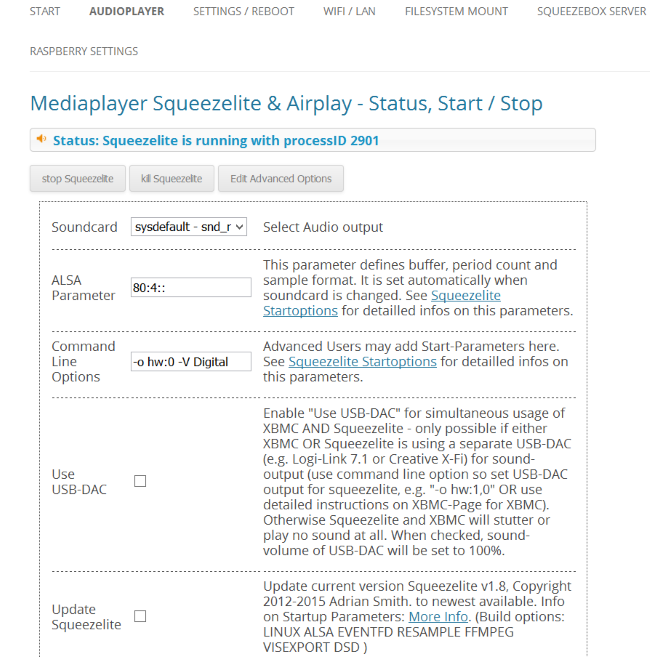 You can connect the volume control for Squeezelite directly to your sound card by adding -o hw:0 -V Digital to the command line options of Squeezelite in its Advanced Settings menu you find in the Audioplayer tab. The zero indicates the sound card’s slot and the „Digital“ is the sound card’s mixer device.